This 4½ mile circular walk from Waterloo Station uses lesser known streets but passes several attractions which can be visited. Southwark and Lambeth North tube stations are on the route. Waterloo Station was rebuilt 1900-22 when it was opened by Queen Mary. The main 'Victory Arch' entrance serves as a war memorial to staff killed in WWI. There is a new statue on the concourse of artist Cuneo - Can you find his trademark mouse? IMAX has the largest cinema screen in the country (20m x 26m) with exterior walls by Howard Hodgkin. The Schiller International University is housed in the former Royal Waterloo Hospital for Children & Women (closed in 1936). First constructed in 1823 it was rebuilt in 1905 in red brick with terracotta dressings and a ceramic facade. One of the 'Waterloo' churches this was built in 1823-4 to the designs of Francis Bedford. It was bombed in WWII and restored by Thomas Ford in 1950. These Grade II listed buildings were constructed as workers houses around 1818. At the end of the street is a former school and some Peabody Buildings. As the name implies this was an area of hatmaking. Paris Garden was a small manor dating back to 1113 originally owned by the Knights Templar. It became Tudor pleasure gardens, was used for cloth bleaching during the Commonwealth and at the end of the 17th century was developed with housing. There is a distinctive tiled building on the corner with Nicholson Street. At the junction with Union Street is a new development designed by Will Alsop. It is worth viewing the interior of Southwark Station which was constructed on the Jubilee extension. The Young Vic Theatre has been re-constructed. It was built on the site of some bombed shops with the foyer featuring the tilework from the remaining butcher's. The death of 54 people following a direct hit on the baker's on the corner of Greet Street is recorded. St Andrew's Church was rebuilt to incorporate flats and communiy rooms as well as worship space in 2006. These Grade II listed cottages were built around 1900 by the Church Commissioners. The playground has been improved under an M&S scheme. The OLD VIC opened in 1816 as the Royal Coburg Theatre and became the Royal Victoria (Music) Hall in 1833. From 1880 it was transformed into a temperance venue by Emma Cons. Later her niece Lilian Baylis put on quality drama including Shakespeare such that it became the home of the National Theatre in 1963-76. It seats 1067 and was purchased by the Old Vic Theatre Trust for £3.5m in 1998. Cross Waterloo Road into Baylis Road. Go into the Millennium Green on the left. This is a pleasant public garden with water features. The building opposite was built for the David Grieg Store in 1928. Only the grand facade remains behind which new offices for the Department of Health were constructed in 1979. There is an attractive children's playground. Just past this go right along Pearman Street to the right of the ambulance station. At the end go right into Westminster Bridge Road. The Perspective Building at 100 is apartments. Christchurch & Upton Chapel stands on the site of a female orphanage founded 1758. The 'stars & stripes' pattern on the spire commemorates donations received from America to build the church in 1873. It was destroyed by bombing in 1940 but the tower was retained in the new chapel and office development. Lambeth North Station features ox-blood tiles. Right into Baylis Street and first left around Murphy Street. Left into Frazier Street then left into Lower Marsh. This former rural village street is now a conservation area. There is a plaque on the SW corner. Left along Westminster Bridge Road. Cross at the junction and go along Hercules Road. Flats have replaced Georgian houses which included the home of William Blake in the 1790s (blue plaque). There are early 19th century cottages opposite. Detour right into Centaur Street. There is an installation of mosaics depicting the work of William Blake. There are also sound stations with recordings of his verse (not much use when the trains are passing overhead!). Return to and continue along Hercules Road. At the end go left along Lambeth Road. There is a blue plaque on number 100 to Captain Bligh, commander of the 'Bounty'. Cross St George's Road to the RC Cathedral. The building designed by AWN Pugin in 1840-8 was never fully completed. It was incinerated in a bombing raid of 1941 and rebuilt from 1953. The stained glass windows have vivid colours. Cross back to the Imperial War Museum and go through the main entrance gates. This is housed in the former Bethlem Royal Hospital for the insane (Bedlam) which moved here from Moorfields in 1815. When the institution relocated to Beckenham in 1926 the flanking wings were demolished. The building is surrounded by the Geraldine Mary Harmsworth Park which includes a Soviet War Memorial, a section of the Berlin Wall and the Tibetan Garden of Contemplation and Peace, opened by the Dalai Lama in 1999. Walk through the Peace Garden, exit into St George's Road and go right. Second right into West Square. The central garden was laid out in the 1790s when the first houses were built and has some old mulberry trees. The Admiralty erected a tower on number 36 for a shutter telegraph that conveyed messages between Whitehall and naval establishments in Kent. Walk through or around the square and exit via Austral Street. The former All Saints Hospital is now used by the Imperial War Museum. At the end cross Brook Drive into Sullivan Road then bear right through Walcot Square (which is triangular!) keeping left of the green. This was donated to the poor of Lambeth by Edmond Walcot in 1667. The present houses were built in 1837-9 and are now part of a conservation area. According to Dickens 'Bleak House' Mr Guppy lived in the square. Exit into Kennington Road and go left then first right along Walnut Tree Walk. This passes Roots & Shoots community garden which offers training to 16-25 year olds with learning disabilities. This is featured in the song/dance from 'Me and My Gal'. Mayhew recorded 164 costermongers in its market in 1861. Right at Juxon Street continuing under the railway around Pratt Walk. Cross Lambeth Road. The entrance to Archbishops Park is here. This was created from land given by the Archbishop in 1900. Continue along Lambeth Road to the roundabout. On the right the Ark occupies the former St Mary's Infants School of 1880 and includes a garden in the playground. Beyond this the redundant church of St Mary Lambeth has housed the Garden Museum since the 1970s. It has stained glass windows to the Trandescants (Royal Gardeners) and the Lambeth pedlar (a stipulation of his donation to the church). Cross Lambeth Palace Road to the riverside and walk northwards. 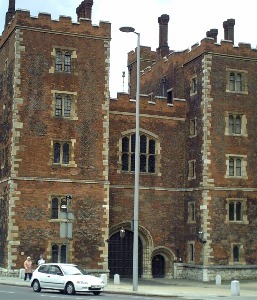 Lambeth Palace has been the official residence of the Archbishop of Canterbury since the 12th century. The gatehouse was built c1495 and rebuilt in 1828-34. There are views of the Palace of Westminster across the river. Further along the riverwalk passes St Thomas's Hospital rebuilt here in 1868-71 to a design approved by Florence Nightingale which included the training school for nurses she established. Only 3 of the original seven pavilions remain plus the chapel. The north end was rebuilt post-war and includes the Florence Nightingale Museum. Westminster Bridge was constructed in 1739-50 and rebuilt to a design by Charles Barry and Thomas Page in 1854-62. County Hall was built for the LCC later the GLC (1965-86) in 1911-33 on a site previously occupied by the Coade Stone factory. It now houses several attractions and places to eat. The London Eye constructed for the millennium has proved popular with Londoners and visitors. Up to 15000 passengers a day can travel in the 32 glass pods rising to 135 metres and giving views up to 25 miles. It may be possible to walk through the County Hall building. This emerges in Belevedere Road with a view of the former Lying-In Hospital of 1828 in York Road. Otherwise go to the right through Jubilee Gardens into Belvedere Road and go left. Access Waterloo Station along Concert Hall Approach just beyond the railway.